I am soooo very excited to show you this project! I gave you a sneak peek of something I was painting last week. It was our bathroom vanity! You know…the one that we just re-did? Yep! We re-did it again! The second makeover turned out WAY better than the first. Let’s take a look back shall we? We bought this dresser at a thrift store last fall for $50. 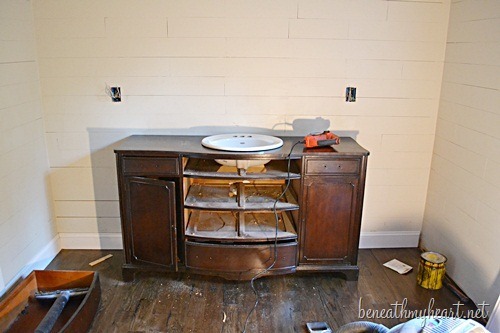 I immediately knew that I wanted to turn it into a vanity for our master bathroom. It really was beautiful. I loved it. But as we continued to work on the bathroom, something wasn’t jivin’ and I couldn’t put my finger on it. I loved the claw foot tub…. But there was something about that vanity that wasn’t sitting well with me. I think I was having trouble with the dark cherry stain. It just wasn’t working with the walnut floor and beams. I started thinking about painting it, but I didn’t want to tell Cy. I mentioned to Cy that I sort of wanted to paint it. And guess what? I’m still livin’! I guess after being married to me for 15 years, nothing really surprises him any more. 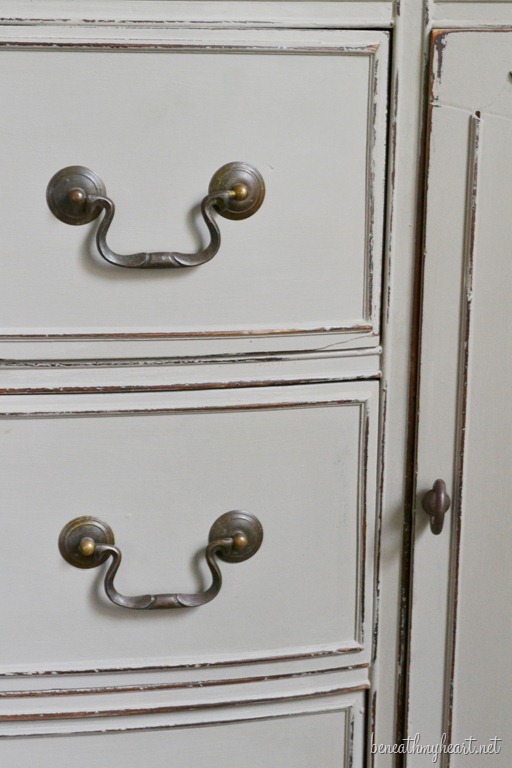 Annie Sloan Chalk Paint in French Linen. I was able to add the original hardware back on the vanity, and it looks great. It is the exact contrast I need between the vanity and the flooring. I was probably more giddy about this project than any other that I have done during our renovation. I was DYING to show you guys last week! It is EXACTLY what I was envisioning for my bathroom, and I am SOOOO glad I painted it! So here is my advice to you for what it is worth. If something isn’t jivin’ in your décor…change it! You’ll be so glad you did. I know I am. Tomorrow, I will show you how I painted the dresser. It was super easy. 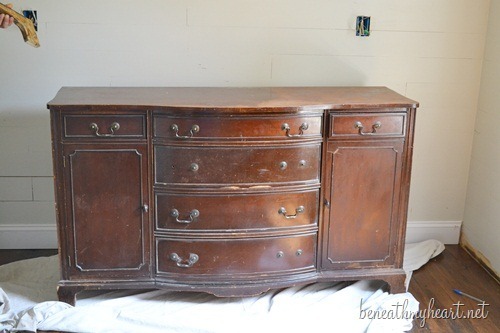 I will also give you a breakdown of the total cost of this dresser turned vanity. Do you like it better stained or painted? I’m one of your lurkers. I have to say I do love your vanity better painted. It is gorgeous. The funny thing is that your original project inspired me to turn the first dresser my husband and I bought together 22 years ago into a vanity. I sanded to bare wood, stained and sealed it. My husband added a vessel sink and beautiful faucet. I love it! Thanks for the inspiration. I am in AWE of your vanity! It’s gorgeous!!!!! You did a beautiful job and you were SO right to paint it! You’ve really inspired me here! Great job! I just love the fact that you were able to put the original hardware back on and it pops so well against the paint. It looks great painted! Painted was the best choice! It sort of took on a new life with the paint!. Refreshed, revived, and reborn!! Very happy it turned out so well. Your master bath is on its way to scrumptious! Really great!!! I can’t wait for the mirror! Where do you find a dresser like that for fifty bucks? Can not do in Chicago. Wayyyy more expensive. It is beautiful! Love it painted, it really shows off the details. I love Annie Sloan paint! I’m trying to get up the nerve to paint my dining room furniture with it. I can’t wait to see your tutorial! I woulda killed you. You’re lucky you’re not married to me. But it looks nice, and I agree that it “matches” better now. So I have to tell you that when I read your posts, I can’t help but read them with your adorable southern accent. And no I don’t read them out loud…. but you truly have a great accent and that makes all your videos so fun! Just had to share! Traci this is beautiful Thank for sharing. I am usually a fan of wood, but in this case your choice was right on. The painted version of the cabinet base looks so much better than the stained – it contrasts with all the wood (walnut) instead of fighting it. Love it! I think it goes better with the rest of the room painted white. Your husband loves you!! I love this vanity though, and can’t believe you got it for 50 bucks!! Your bathroom is fabulous! Can’t wait to see the finished product. It looks AMAZING, girl!!! I’m loving your master bath! Yep! Perfect! It was beautiful in all its sanded and stained glory, but I agree something was off. Poor Cy and all of his hard work. :( Aren’t understanding hubbies the bestest. :) Happy Labor Day. 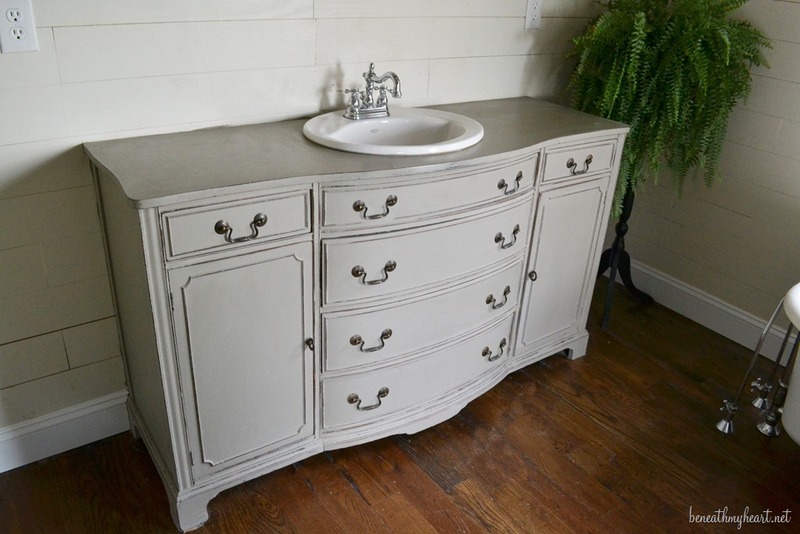 The stain was beautiful but the painted vanity is perfect for your bathroom. Job well done. The cabinet looks GREAT!! I am curious though of Cy’s reaction to you wanting to change it. My guess he wasn’t even surprised when you suggested it. Am I right?? After 36 years with my guy he doesn’t even bat an eye anymore with my “brainstorms”. You go girl! The paint looks fantastic! French Linen is a gorgeous color, I might have to try that chalk paint!!! It’s gorgeous, Tracy! I like the painted version better as well, although the stained version was pretty. Sometimes it can be trickier to mix woods than you’d think. Painting was definitely the right choice. The whole bathroom is lovely! Love, love it, Traci! I really like the painted version too, you can’t go wrong with that. Your bathroom is really coming along & I love all the details. Good for you for getting what you want. I’m working on bathrooms too, but mine won’t be anything like this. I’m just trying to make them presentable. You are a riot! I loved it stained UNTIL you started showing contrasting pictures against the beam, hardwood flooring, the tub. And then I starting thinking yeah, I AM LOVING THIS PAINTED VANITY NOW!! PERFECTION MY FRIEND!!!!! GREAT JOB!!!! I did prefer it stained in the “inspiration” photo, but I think the painted version looks best in YOUR space. It wasn’t so much the mix of woods, but the contrast. Being so dark, it just took over the space. It also looked much more formal when stained which again, does not seem to be the look you’re after. Your “inspiration” photo had that more formal vibe as well as the toning marble top. I think that’s why it worked in that space. Very good choice of colour , as well. You gut was right, Traci! Your bathroom is coming together so beautifully. The beams are just to die for. You did a great job paining the dresser/sink vanity. It all looks just great! Beautiful job! But, I have a question. 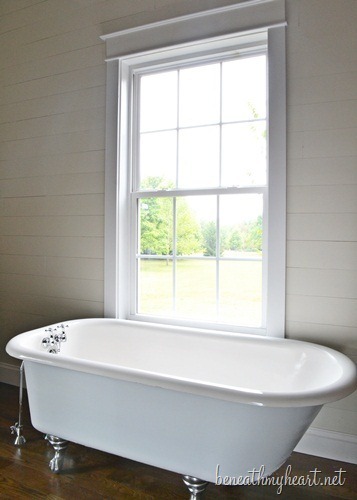 What do you have planned for that window near your claw footed tub? Will it be covered for winter? Love the look of EVERYTHING so far but for some reason when I looked at your room this time, I mentally pictured a nice hot steamy bubble bath next to a frosty window! wonderful.. this is the thing I have wanted to do for years but since i am not as capable as some of the bloggers it is still a vision in my head. My hsb thinks i am crazy. some of the pictures like this seem to be giving him a better idea that it is possible and he is very capable. oh i do like the painted version much better. I love it painted the best! You have a good eye, so it’s good to trust your gut. The painted vanity is beautiful. I’ve seen other projects done with Annie Sloan paints and I’ve looked at the website. When you give us details on how you did this, would you give some reasons that you chose Annie Sloan paint. Also, since that paint will require some effort for me to obtain – could you give a suggestion for the nearest equivalent more readily available? 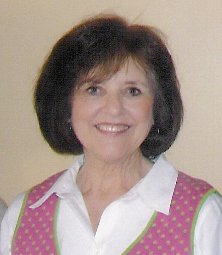 Thanks so much for the inspiration and instruction that you share with your posts! I must say I like your vanity a lot better painted! I’m not one who gets the urge to slap paint on every wood piece in sight, either. I LIKE unpainted furniture, but you just didn’t have enough contrast going on there with your wood floor. The painted finish works a lot better! I’m obsessed with French Linen — it’s just such a gorgeous neutral and of course, is perfection for your vanity! LOVE! oh my! how beautiful! looks so much better, doesn’t it?? Love it! It does look fabulous painted. What is it with men and painting wood? Need to Google that paint, never heard of it. I got inspired to whitewash my fireplace, but am going to have 18″ travertine squares put up. The whitewash just didn’t do what I wanted. It came out beautiful – perfect paint color! in the words of Po from Kung foo panda it is “pure awesomeness”! I LOVE it! Or imagine the Hallelujah chorus singing out loud with that fantastic painted reveal! It’s the perfect contrast. 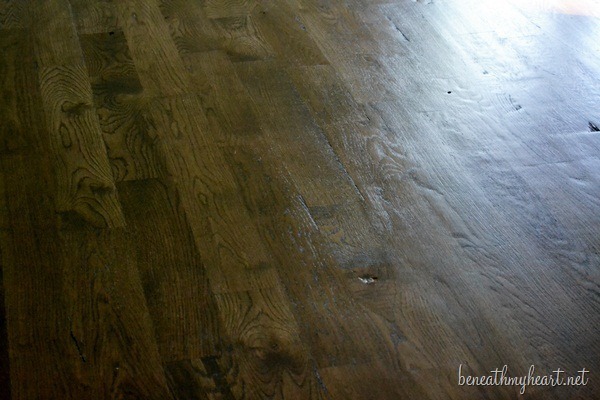 I have this issue in my bedroom….hardwood floors and then cherry furniture….it just is too much “wood” for one room! Can’t wait to see how you did it!! What an inspiration. I have this same buffet with its matching china hutch. They were my grandfather’s. We will be moving to the desert in a couple of years and I’ve been torn about what to do with the set, since they “clearly” won’t be a good fit. But with that milk paint, I could totally make them work! Thank you so much. 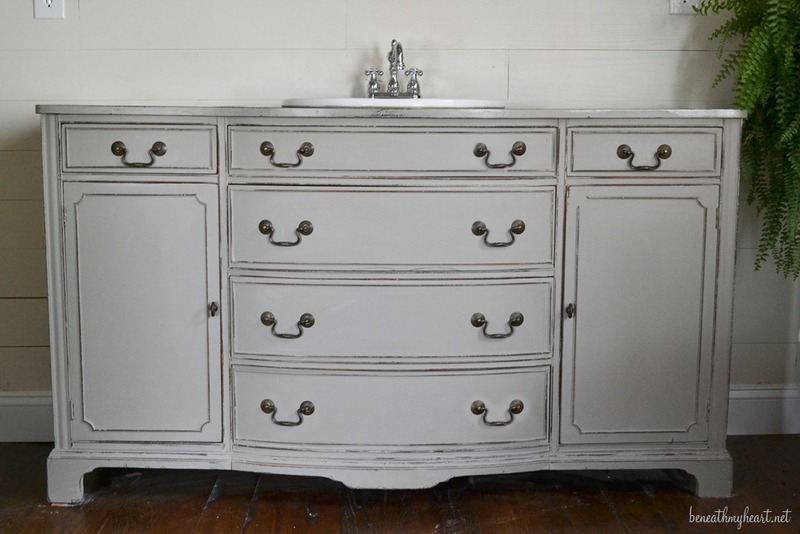 It was beautiful stained, but it is the focal point of the bathroom in the painted version! Congratulations on a good renovation! Nice work, lady. I’m so glad Cy didn’t choke you for wanting to paint it, I know he loves ya! It looks great, Traci! I agree, it works perfectly with everything else in that gorgeous room. 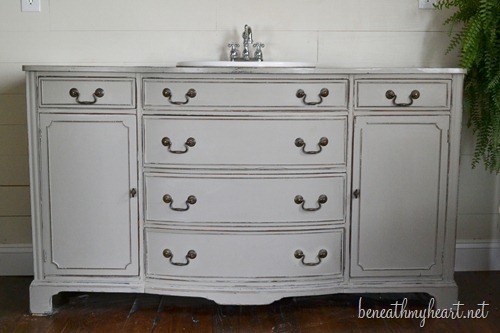 I just painted a vanity in our powder room with French Linen and absolutely love it. Such a great color! I LOVE it. 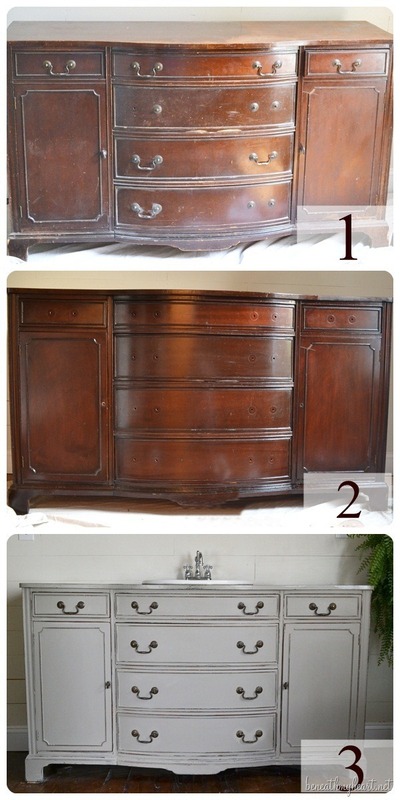 It was beautiful after the first time you refinished it, but it definitely is a stand-out piece now! You made the right decision! The color is stunning and works so well with your bathroom. After seeing this vanity on facebook the other day, I dreamt that I dropped in on you at home and went upstairs to take a peek at your remodel..and I found you asleep. You woke up and told me I could look around. And if I remember right, Cy was working on something. So funny where our dreams take us! I love repurposed furniture and one day would love to use a dresser as a vanity. Thanks for the inspiration! Love it painted for your area. I am wondering how did you protect the top from water, hairspray, etc? Although I loved the cherry finish, the white does look better in that room. I love the idea of doing this in my own master bath, but several people I know who have this type of set up have experienced the top of the dresser getting water damaged over time. Did you do anything special to protect the top of the dresser? This is fantastic! Really fantastic. It looks slightly gray in the photos. Is it? I love love pale-ish gray and I need to find something to paint this lovely color. I really enjoy following your blog and your always-great work, but THIS is exquisite. Extra so. Just had to comment! PAINTED! :-D Love, love, love it!!! Beautiful! Glad you painted it! Looks fabulous! Traci, it is absolutely gorgeous! I LOVE the color. I’ve been wanting to paint our existing bathroom cabinets, but have avoided broaching the subject to the hubs. You have given me the courage to at least discuss it with him. We have been married for 38 years so he’s pretty accustomed to my whims. This is absolutely gorgeous beyond belief!!! Love it! I’ve been thinking of doing a similar project! 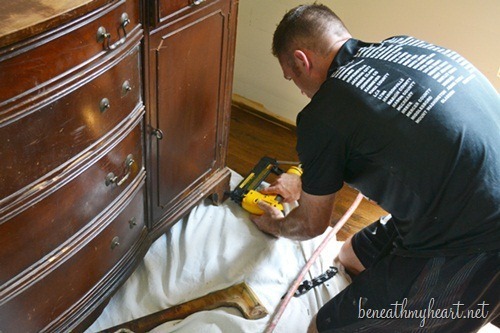 How did your husband re-attach the fronts of the drawers that could no longer function, as you had to make room for the plumbing? I love both colors. The make over was perfect for the space. 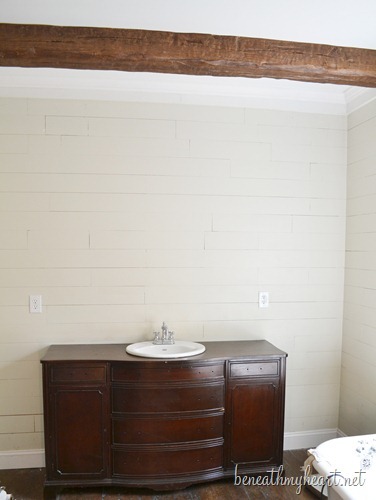 I’m looking for a small (24 inch or less) piece to use in our tiny master bath. I’m loving the thought of cherry finish with my new black and white tiled bathroom. I actually like the the light color for our bedroom furniture. I have the very same piece, only mine is a buffet. Bought for $40.00 at an antique auction in Montana, it was the sleeper of the day. Upper left is a silver drawer. I would love, love to paint mine…but I am SURE my husband won’t let it happen. Hopefully, your pictures will help…AWESOME!!! 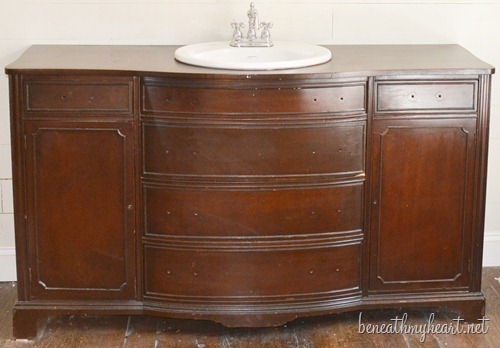 Love the vanity- exactly what I’m thinking of doing in our master. Did you put any protective coating on the top since water may get on it from time to time? That’s the only party I’m leery about. It’s just GORGEOUS! 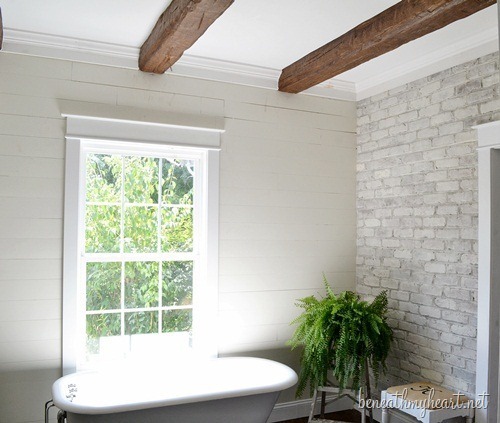 Great job, love it painted…your bathroom is dreamy :)! I wish we had room to do the same thing, but our master bathroom is teeny tiny…I just may paint the vanity though, even if we don’t have the space for a beautiful dresser vanity :)! Ours is cherry wood also, and it’s buggin me, it just doesn’t quite go with the rest of the space, lol! I LOVE this vanity… I am considering doing this in my master bath as well! My question is, now that you’ve been using it, how is the top holding up? I can’t decide if I want to put a whole new marble top with the sink attached or just cut a hole in the wood for the sink. I am worried I will be too rough with hair products and such and mess up the wood top. Thanks SO much for any feedback you can give me! Just purchased old dresser to do this but am concerned how painted surface works for sink area, could you advise me on type of paint to use or how to seal to protect from water damage? Love you vanity! You can use any kind of paint. I suggest sealing with a satin polyurethane. 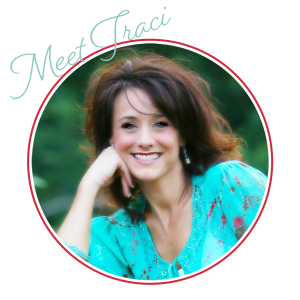 Traci, I absolutely love your vanity! I am in the process of revamping my bathroom. 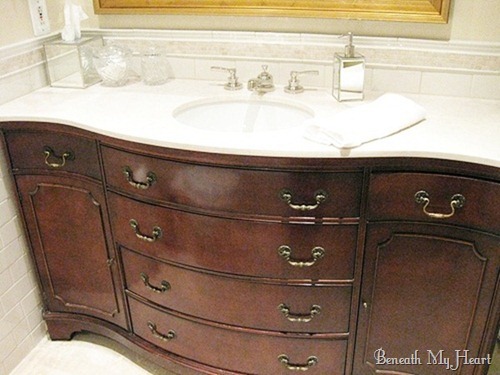 It is so small that finding the right size piece for a vanity will take some time. So until I find it I have just decided to painted my regular laminate vanity. 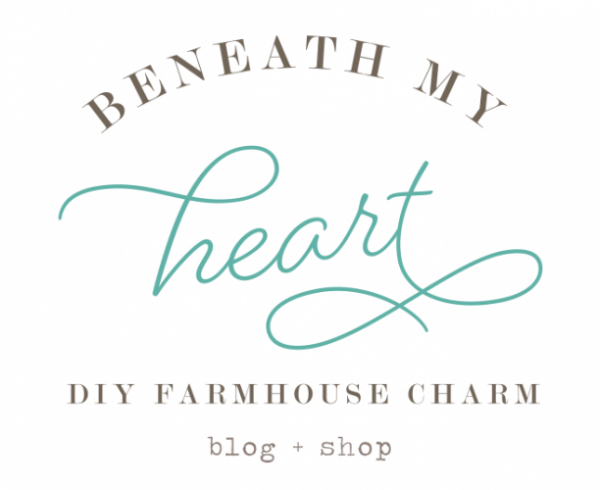 Love your blog too! I love this! I have a question, how did he make space inside for the plumbing and storage? Did he cut into the drawer? Do you have a pic or closer pic of the stage where he’s doing that part? I do not have a post about how he did this part, but he basically cut a cut-out in the top two drawers to make room for the plumbing. The drawers are functional in that you can pull them in and out, but they cannot hold storage. The bottom drawer can. I am wanting to know about the top.. Since it will get the most use! Did u do anything special to seal it and what about cleaning?? I didn’t use anything special at first, but I eventually sanded off the wax, put a fresh coat of paint, and sealed it with poly. I think that makes it a little more durable. 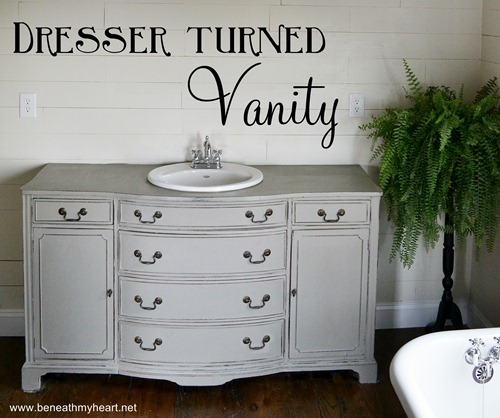 Love the buffet turned vanity idea! I bought the same buffet at a thrift store as well and we have painted it. All the beautiful vintage hardware is beautiful. One of the original cabinet pulls is missing on mine. 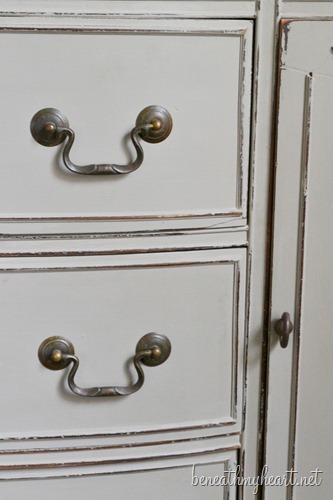 Do you have any suggestions on where I could find a vintage cabinet pull to match? 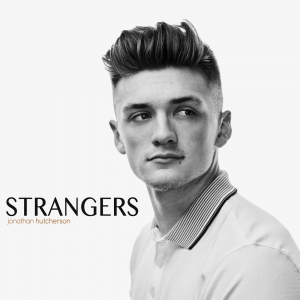 Any info on the style or year would also be beneficial. Basset is the brand of my buffet. Thanks! I love what you’ve done with this piece!!! I have one very similar that I want to repurpose for our cabin master bath. Ours is not fully wood and I’m wondering if it can still work? I want to put a granite top on it instead. Did you run into any issues with your installation? Hi, I love your vanity!!! I am trying to do one for our bathroom but am running into a bit of trouble. We can’t figure out, after you have set the drawers over the plumbing in place, how you get in to work or check on them. Was this a problem for you? This wasn’t a problem for us. Our drawers are still functional, so we just pull them out to get to the plumbing. Are you able to remove your drawers? We don’t actually have a dresser yet… we just haven’t found one hat feels just right;) Thanks for your reply! I didn’t know the drawers still opened. That might just solve our problem though! Looking to do something like this but was curious about the water. After a few years how as the top of the vanity held up? Did you seal it with anything extra? Thanks!